“I was put through to him straight away and he confirmed it, religious and cultural reasons. I said that was totally outrageous. I asked him to elaborate and he refused,” Belman said. “I am extremely upset about it. My child went in having spent an hour preparing and making up her pinhole camera. This is an issue about scientific matters versus religious superstition. “I am outraged – is it going to be Darwin next? We will be like mid-America,” he added. North Primary School, which has no religious affiliation, has yet to elaborate on which religions or cultures deem looking at a solar eclipse to be offensive. Social media users in the UK expressed their bafflement at the news. One Twitter user poked fun the announcement, while another voiced disappointment. Worth noting that North Primary School, which ordered pupils to throw stones at the angry moon, sorry, skip the eclipse, is "non religious"
Kids at a primary school in London were banned from watching the eclipse for 'cultural and religious' reasons. Words fail me. 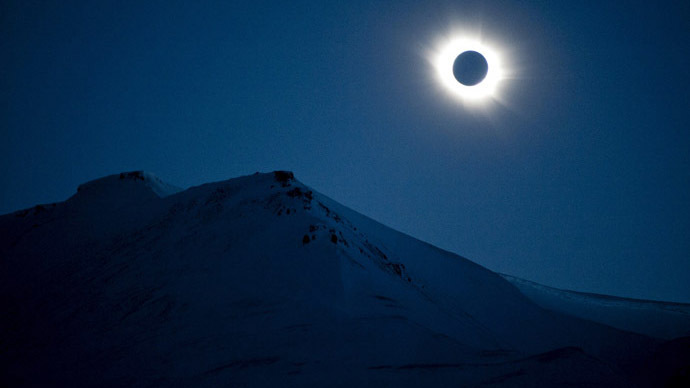 The first eclipse of the 21st century was visible across the UK and northern Europe on Friday. In the UK, the moon obscured at least 83 percent of the sun, reaching its peak at 9.35am. The auspicious date of the rare celestial event, falling on the vernal equinox and a fortnight before a ‘blood moon,’ has caused some religious commentators to suggest it’s a sign from God. Pastor Mark Biltz, author of ‘Blood Moons: Decoding the Imminent Heavenly Signs,’ said the eclipse was a message of heavenly displeasure with Europeans for criticizing Israel. Speaking to US news website WorldNetDaily (WND), he said: “In Jewish tradition, a total solar eclipse is a warning to the Gentiles and a sign of judgment on the nations. “When we look at where the darkness will be, it will be in northern European countries like England and Sweden where we see the rise of Islam and anti-Israel sentiment. “Europeans especially should take heed,” he added.